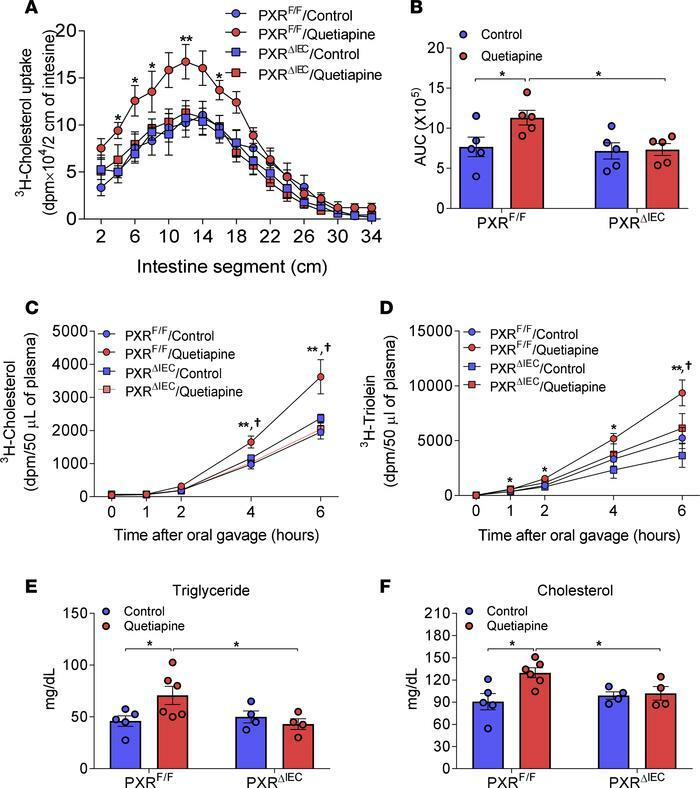 Quetiapine increases intestinal lipid absorption in a PXR-dependent manner. Eight-week-old male PXRfl/fl and PXRΔIEC littermates were treated with vehicle control or 10 mg/kg/day of quetiapine by oral gavage for 1 week. (A and B) Distribution (A) and AUC (B) of radioactivity in intestinal segments of PXRfl/fl and PXRΔIEC mice after an oral challenge of oil containing [3H]-cholesterol for 2 hours (n = 5, 2-way ANOVA, *P < 0.05, **P < 0.01). (C and D) Cholesterol (C) and triglyceride (D) absorption rates in control or quetiapine-treated PXRfl/fl and PXRΔIEC mice. Mice were injected with lipase inhibitor poloxamer-407 followed by gavage with [3H]-cholesterol (C) or [3H]-triolein (D). Plasma samples were collected over 6 hours and measured for the presence of [3H]-cholesterol or [3H]-triolein (n = 3–7, 2-way ANOVA, *P < 0.05, and **P < 0.01 compared with PXRfl/fl mice treated with control; †P < 0.05, compared with PXRΔIEC mice treated with quetiapine). (E and F) Mice received an intragastric lipid load (10 μl/g body weight of olive oil) after 4-hour fasting. Blood samples were collected 2 hours after the lipid bolus, and postprandial plasma triglyceride (E) and cholesterol (F) levels were measured by standard methods (n = 4–6, 2-way ANOVA, *P < 0.05).